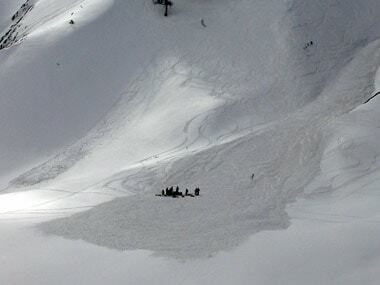 Geneva: Three cross-country skiers were killed and four others were injured in three separate avalanches in the Swiss Alps this weekend, police said on Sunday. Two Swiss skiers were swept away on a massive sheet of snow on Sunday afternoon in the Chateau d'Oex area, and slammed into a rocky area below, police in the central Vaud canton said. One of the skiers, a 55-year-old woman, died on the spot, while her 61-year-old companion was injured. He was flown by helicopter to hospital, and police said his life was not in danger. In another incident on Saturday, an avalanche on the Tsa mountain, above the village of Arolla in the southern Swiss canton of Wallis, swept away four skiers on Saturday afternoon. Rescue workers arrived by helicopter and were able to dig out the buried skiers, who were all Swiss nationals, and flew them to hospital. Wallis police initially said all four were injured, but on Sunday morning they announced one of the skiers, a 40-year-old woman, had succumbed to her injuries. Police in Bern canton meanwhile said an avalanche in Lauenen, near Gstaad, hit two cross-country skiers around midday Saturday. One of the men, whose ages and nationalities were not given, was buried and so badly injured that he later died in hospital, police said.